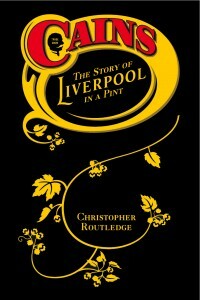 The extract above, from the ledger of the brewer at Liverpool’s Cains brewery, on Stanhope Street in 1867, confirms that Porter was, and is, a kind of Stout. Here the brewer begins by saying that on March 2nd 1867 he brewed a “XXXX Porter” using a combination of pale, brown, and black malts, but his closing statement gives it away: this was “a good fermentation and excellent Stout”. 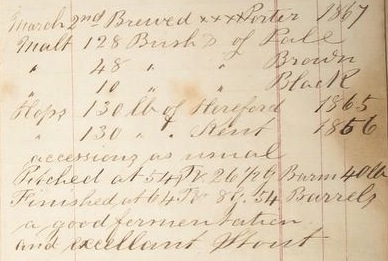 Perhaps a brewer might like to comment on the hops used in this brew: 130lb of Hereford (1865) and 130lb of Kent (1856). That’s not a misprint: brews in this ledger often include hops a decade old, or older. So the answer to the question seems to be that Porter is a kind of Stout, but that what makes a Porter Porter (and not Stout), is open to interpretation. Is that clear now? Next ›How Shakespearean Are You?